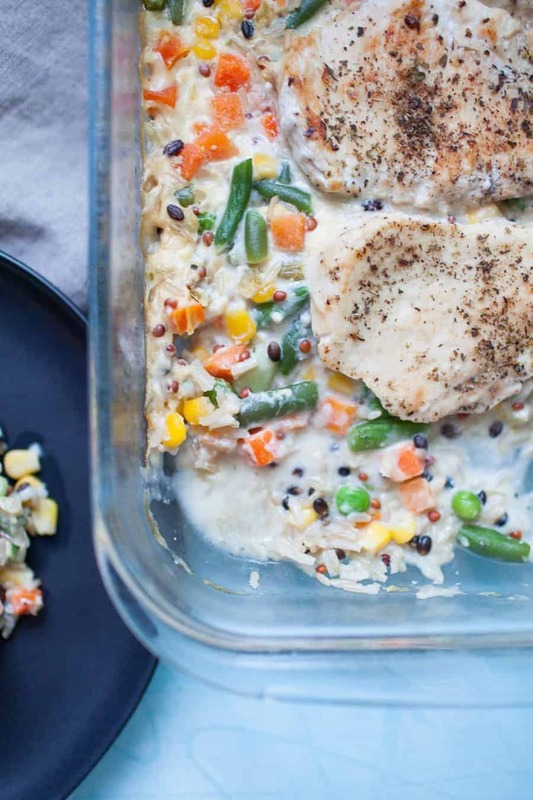 This Chicken Wild Rice Casserole is a classic, quick dinner option that the whole family can enjoy. 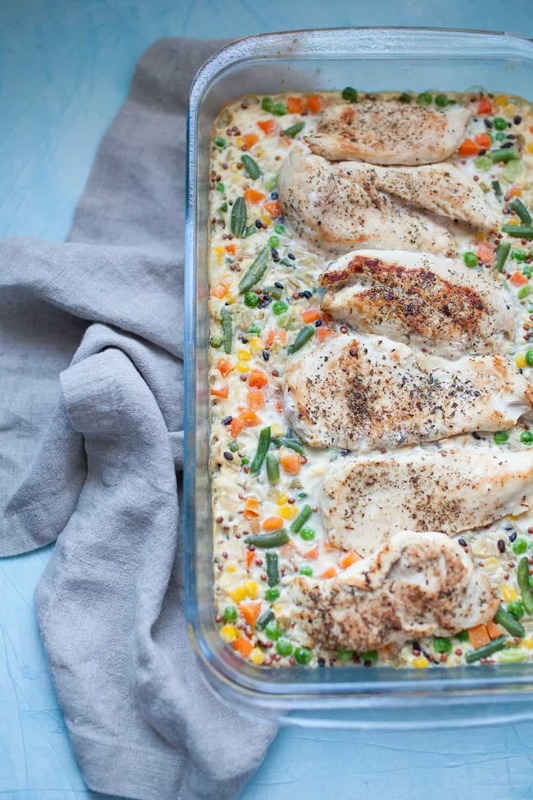 This casserole is made with chicken, cream of celery, frozen veggies and wild rice. It’s perfect for busy nights or making ahead of time! This recipe is a simple twist on a comforting casserole that the whole family will love. This post is a part of my series on bringing meals to others. This Chicken Wild Rice Casserole is perfect for sharing with someone who could use a home cooked meal because it only requires a few quick ingredients and it’s a comforting casserole dish. This series is all about bringing meals to people who are going through a transitional or tough time. For more information, visit this page. We have an old cookbook that comes from a nature foundation that Steven’s grandmother used to run. The cookbook was put together as a fundraiser for the foundation by collecting recipes from the community. There are recipes from Steven’s mom, dad and aunts in the cookbook plus hundreds of others that are tried and true family recipes. I thought that maybe I had seen a recipe for chicken and rice casserole in there because there are so many classic recipes, but when I looked again I couldn’t find it. After a quick Google search, I figured it out. It turns out it’s an old recipe that was part of a magazine ad for Campbell’s cream of chicken soup. I’ve tweaked that original recipe a bit over the last few times of making it, but the premise is still fairly similar. Chicken, rice, frozen veggies and a can of soup. Do you know what that kind of recipe spells? A suuuuper easy dinner. When you have a recipe for a super easy dinner, it’s a no brainer to use it as a recipe that you can bring to someone else. The flavors in this recipe are simple and classic. When you’re bringing dinner to someone else, it can be tempting to try to make something super fancy or elaborate. But the truth is the times when people need a meal, like having a baby, losing a loved one, going through a tough time or transition, they need a meal that is simple and comforting. You want to make sure that the meal you bring is something that the person’s whole family can enjoy, even if there are picky eaters or little ones. Luckily my toddler son loves veggies, but for those that don’t, with this dish they’re still getting a hearty meal with simple ingredients. We served this for dinner one night when we had a friend visiting. He was on a business trip and staying with us, but had just had a few very full weeks of busyness at work. I could tell when he sat down to eat dinner that he just needed a good home cooked meal. And I was thrilled to be able to provide that for him. I think those kind of moments really show the power of simple, comforting dishes. They can go a long way in raising someone’s spirits! 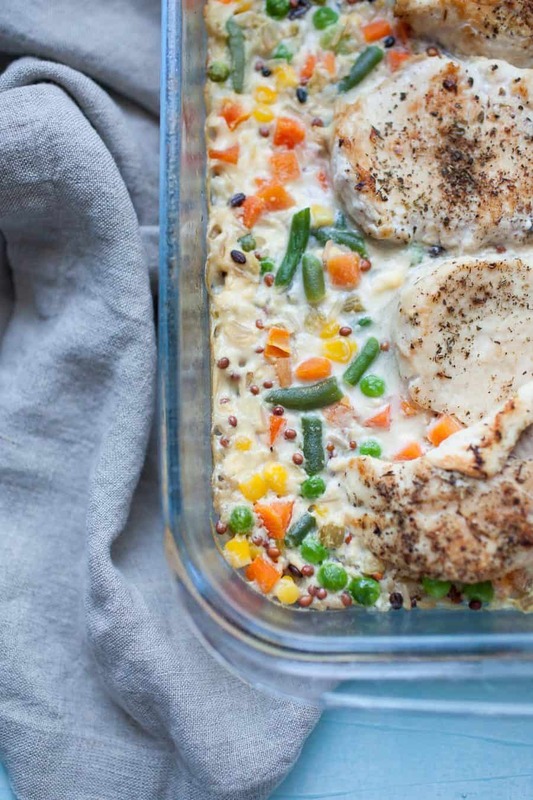 Ready to make your own Chicken Wild Rice Casserole? Scroll down to find out how! 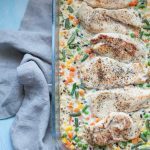 This chicken wild rice casserole is a classic, quick dinner option that the whole family can enjoy. 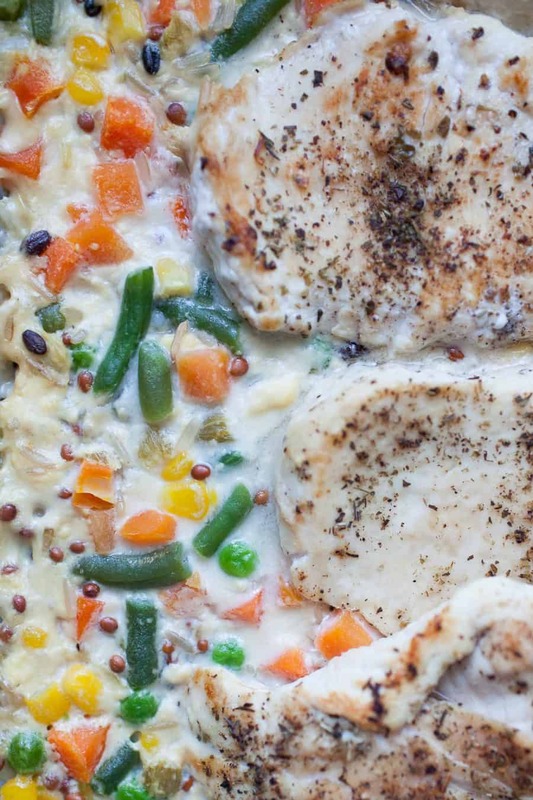 This casserole is made with chicken, cream of celery and frozen veggies. It’s perfect for busy nights or making ahead of time! This recipe is a simple twist on a comforting casserole that the whole family will love. Mix together cream of celery soup, water, garlic powder, rice and mixed veggies in a casserole dish. Cut chicken breasts in half, through the center to make them thinner. Bake for 45 minutes or until rice has absorbed liquid and is cooked through and chicken has an internal temperature of 165°. Top with cheese once removed from oven or during the last five minutes of baking time. Substitute Italian seasoning or just salt and pepper if you don’t have Shallot Pepper. I like to brown my chicken in a skillet first before baking it, but this is a totally non-essential step. I just like the way seared chicken looks better. Some rice takes longer to cook than others and may require adding more liquid. Refer to package instructions to see if the rice you’re using takes longer than 30 minutes to cook. If it does, I recommend adding a little extra water in the mixture to be sure the rice cooks thoroughly. Nutrition information does not include shredded cheese. I may just be planning my entire weeks menu from all your recipes. YUM! This sounds so good. I’m definitely trying it out this week. This is such an easy recipe to throw together and we loved it! Budget friendly and a great option for a quick family dinner! Yay! So glad you liked it. We need to have it again soon.